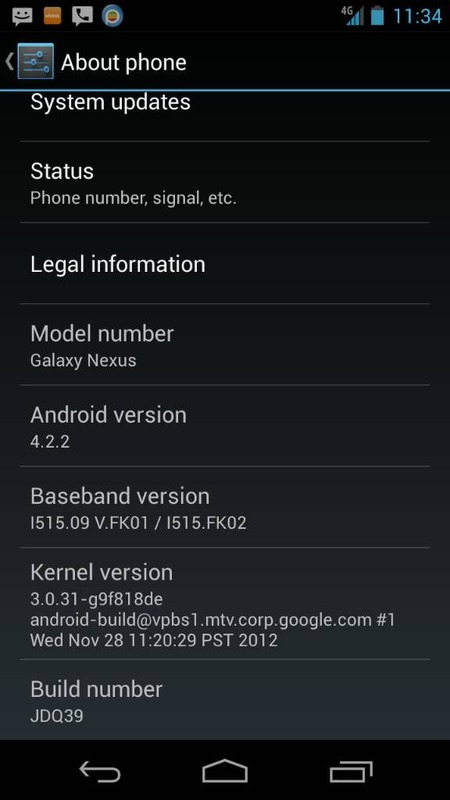 It's been a long, long time coming, but the official Android 4.2 update for the Verizon Galaxy Nexus is here. The black sheep of the Nexus family has waited for four months to get updated to the latest release, and while Verizon is currently testing the software for a probable release later this week or month, you don't have to wait that long. Long-time Android tipster WinDroidGuy got his hot hands on the update ZIP package, and eager users can download it right now. The 4.2.2 JDQ39 package is an update, not a standalone image, so in order to run it you'll need to be using the official Android 4.1.1 build JRO03O (you know, the one that was released to AOSP four updates ago). If you're one of the many, many Verizon users on custom ROMs, including AOSP-based ROMs, you'll have to first install the older version. You can then flash the new ZIP file via a custom recovery like ClockworkMod or by using the more technical ADB sideload method with a PC. Verizon Samsung Galaxy Nexus 4.2.2 JDQ39 - Thanks, WinDroidGuy!